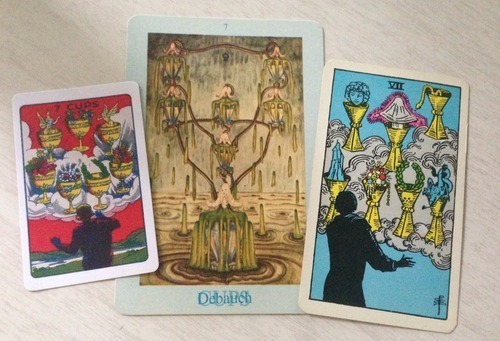 The 7 OF CUPS is a very curious, steamy, dreamy card in any Golden Dawn based deck. Does it make you feel all fuzzy when it comes up? Does it make you want to toss chunks? Are you undecided? Let’s dive in. All the 7’s in hermetic decks correspond to the 7th sephiroth on the tree of life, NETZACH, which we can consider as human instinct, the ID, maybe even the group mind. The 7 OF CUPS is Netzach in the world of Water: instinct plunged into the vast shapeless ocean. Venus in Scorpio can be interpreted in many ways depending on which Astrologer you follow, but no matter what Venus is highly sexual in Scorpio, plunging her paramours to the recesses of the forbidden. But when Venus is in Scorpio, she is often misunderstood, sensationalized or made a scapegoat by those who wouldn’t dare plumb the depths of their own libidos. And of course Venus in Scorpio is often seen as wildly possessive both of her lovers and of what material trappings she considers rightfully hers. All of this is added into the 7 of Cups! And to make matters even more unbearably beautiful, Venus is the ruler of Netzach. Cue Bananarama. The Rider Waite (and its Thomson Leng facsimile) show a man standing before a dreamy cloud of luxurious golden cups. Perhaps this man is trying to choose the holy grail, but can’t decide. Both these cards clearly depict Netzach in the world of water (a persons mind lost in a vast ocean of pre-conceived ideas) but I see little evidence of Venus in Scorpio. Perhaps the a true depiction of this would have been to naughty for 1909 when the Rider Waite was released. The one way Waite depicts Venus in Scorpio is to show a man obsessed with was he considers to be rightfully his, but does not have. Take a look at the Thompson Leng version of this card, where each of the cups are filled with roses, laurels, angels and daisies. Doesn’t it feel like an evangelical delusion of grandeur? Perhaps this is a man who has a very hidden yet very active freak flag? Ted Haggard anyone? Maybe this card is asking us to consider what we find utterly reprehensible in others is actually deep (like Scorpio deep) inside of us. Crowley himself (writing under a pseudonym) said Marie Antoinette is the poster child for the 7 of Cups. I’d wager she was pretty misunderstood, or at least over sensationalized. In her lifetime she was reviled and derided for her supposed sexual adventures, her love of luxury, and her beauty. And of course she was beheaded for it. What do you think of the 7 of Cups?